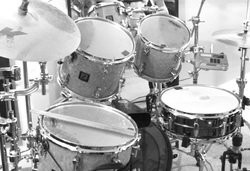 I teach from a purpose made, sound proof studio, that is equipped with two acoustic drum kits, an electronic drum kit and a range of hand percussion. I have professional monitoring and recording facilities, with software to slow down songs for analysis and play along. I am able to e-mail students recordings made in lessons or tracks they have played along to. I have a fully stocked percussion library at hand for use during lessons.